The “Spain National Pro Jiu-Jitsu Championship” took place on December 16th and gathered best sportsmen from all around the world. Ukrainian fighters from SC “Borets”/ ZR Team were also among the participants. They honorably represented the country by showing excellent skills at the championship. The coach of the club, Ievgen Skyrda, noted that the “Spain National Pro Jiu-Jitsu” championship was rather complex and complicated. Loud Spanish fans in the stands and spectacular matches between well-trained contenders gave the impression that you are on the bullfighting! 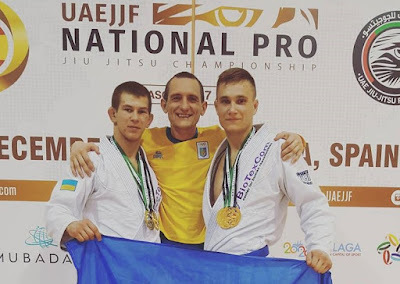 Ukrainian fighters won three golds and one silver medal. Roman Nepota has won the first place in both absolute and his weight categories among blue belts. Yaroslav Blazhko also took gold in absolute division and silver in his weight among purple belts!